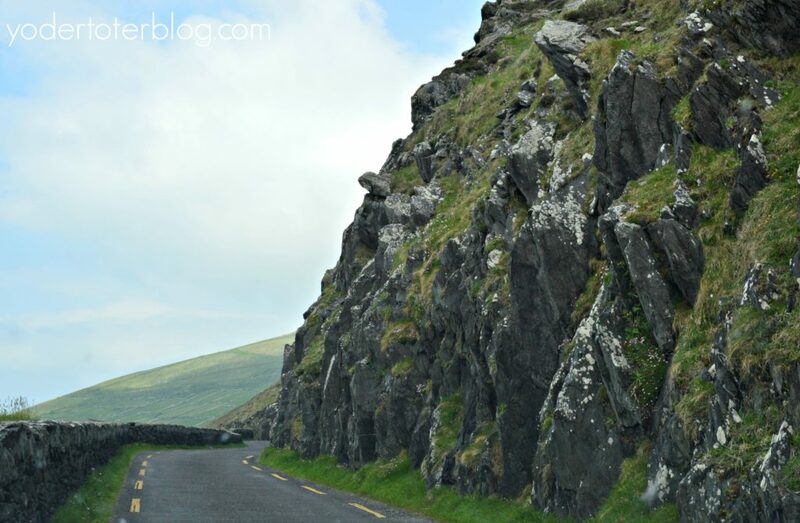 The Dingle Peninsula and Slea Head Drive were a slice of quintessential Ireland. We drove on a beach, held baby sheep, walked among ancient churches and visited Star Wars filming locations. 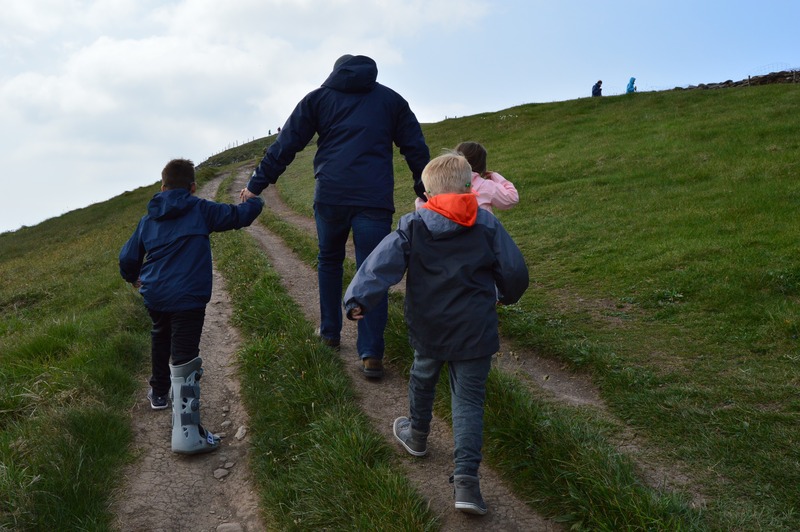 Yes, we packed a lot into one day on the Dingle Peninsula and Slea Head Drive – and we left with our hearts full of wonderful family memories. 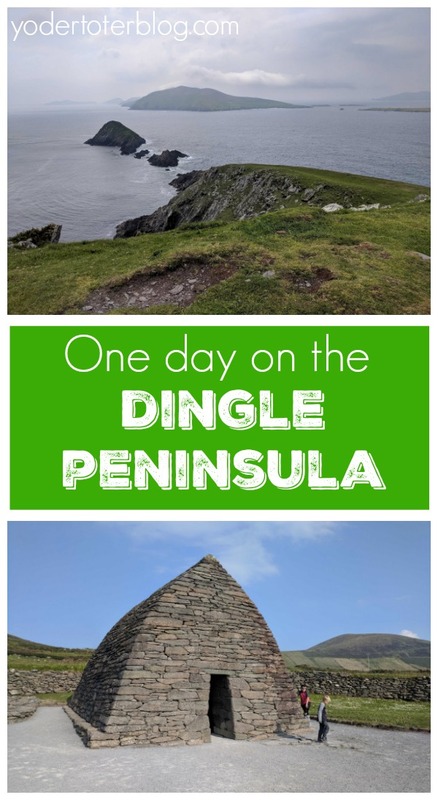 Here’s how we conquered the Dingle Peninsula in one day. My first tidbit of advice is- Start your day early! If you’re visiting Ireland in summer, you’ll have plenty of daylight on your side. Thankfully, we visited in May and the sun was up until after 10 pm (not the best for putting young children to bed, but great for traveling). 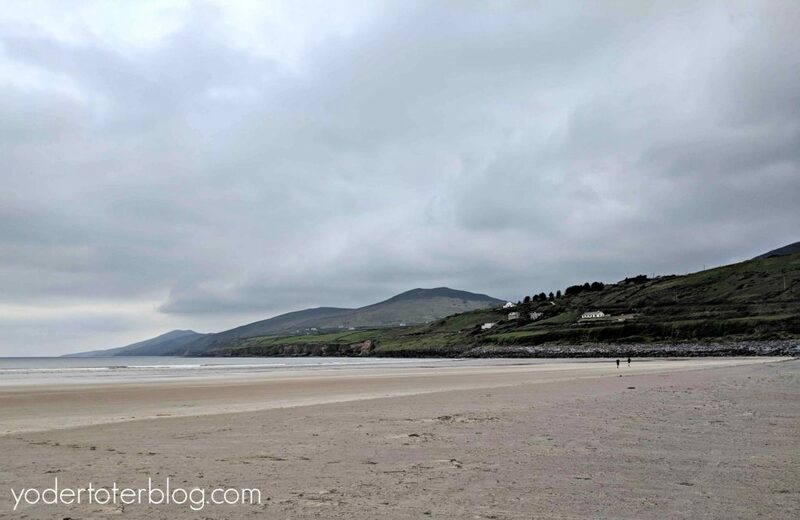 If you’re traveling from Killarney or Tralee, the first major stop you’ll encounter is Inch Beach. (Note: Slea Head Drive is usually driven in a clock-wise manner. So beginning your tour on the south end of the Peninsula is best). Inch Beach is over 5 kilometers of sand. Mr. Yoder INSISTED on driving the rental car on the sand – everyone was doing it. The beach is easily driven on, just stay towards the solid sand, as we did see a few drivers get stuck! There are public toilets at the Inch Beach parking lot, so make sure you take advantage, as toilets on the Dingle Peninsula are few and far between. 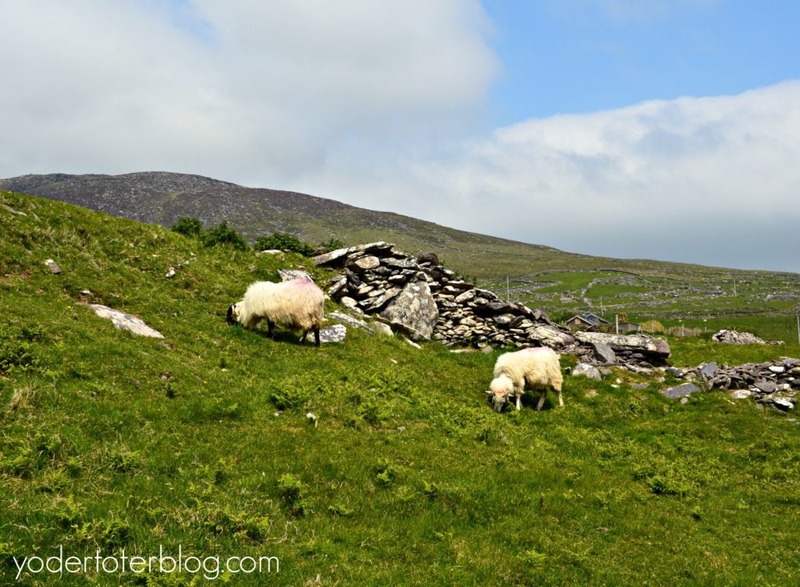 We continued through the town of Dingle and embarked on the Slea Head Drive. Our first stop was at the Stone House Restaurant, opposite the Dunberg Fort. The Fort is currently closed. We used the large parking lot of the restaurant to eat our picnic lunch, enjoy the views, and pay 50 cents each to use the toilets. Just a kilometer further you’ll come upon the first beehive huts. Visitors pay 3 Euro for adult admission and must be able to ascend a steep hill. We asked the kids to imagine was life would have been like for these early Irish inhabitants. It’s believed that the Beehive Huts at Fahan were used around the 12th century as the Normans pushed the Irish off of the good land and out to the Dingle Peninsula. Make sure you take in the view from here- on a clear day you may see Skellig Michael, but at the least, you’ll see plenty of resident sheep and numerous rock walls that have been dividing the land for centuries. Another kilometer down the road is a family-friendly farm. 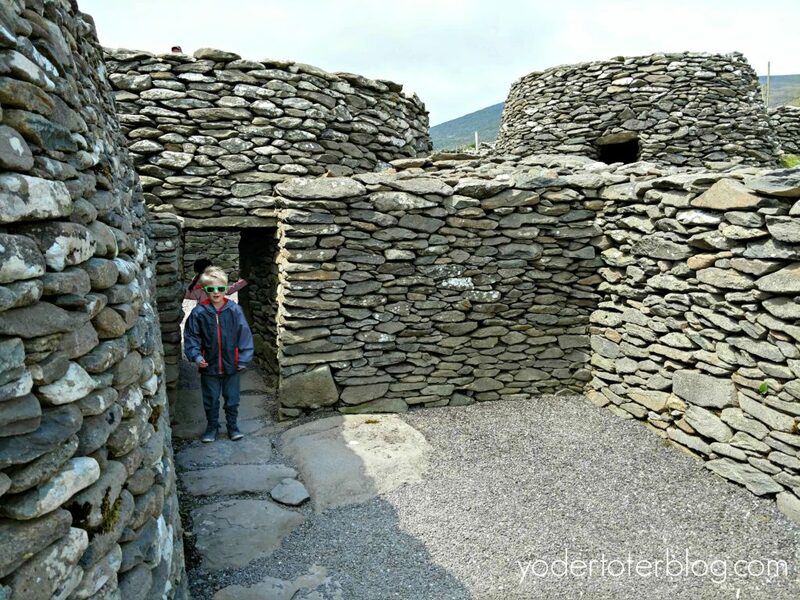 Here one can view more Beehive Huts, hold a baby sheep, and get a snack or coffee. 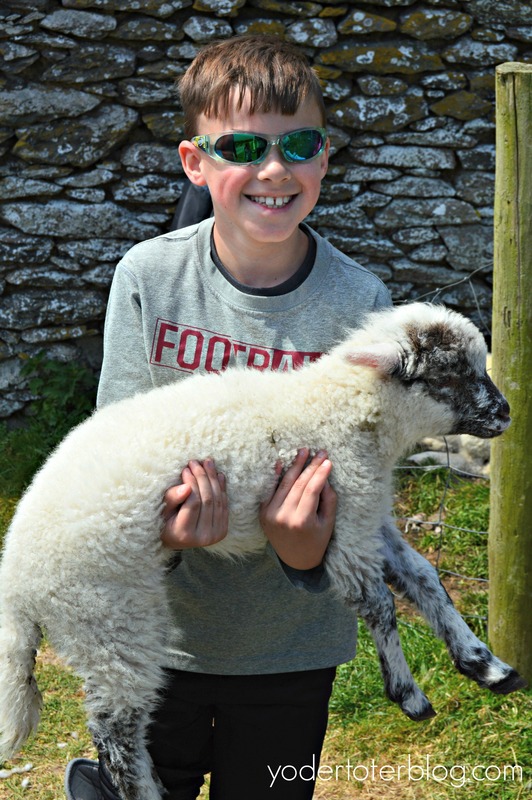 We willfully handed over 10 Euros to let our kids hold a baby lamb- #tourists. You may think this is just a stop for kids, but we saw a couple of newlyweds also stopping for a cuddle. Probably one of the most photographed spots on the Dingle Peninsula is Slea Head. A small parking area allows visitors to view the winding road, Blasket Islands, and a crucifix. This is a narrow area- we would not let the kids get out of the car! Not much margin on the turn at Slea Head. Less than a kilometer from Slea Head is Dunmore Head, the westernmost part of Europe! We climbed to the head as a sign indicated this was a Star Wars filming site. 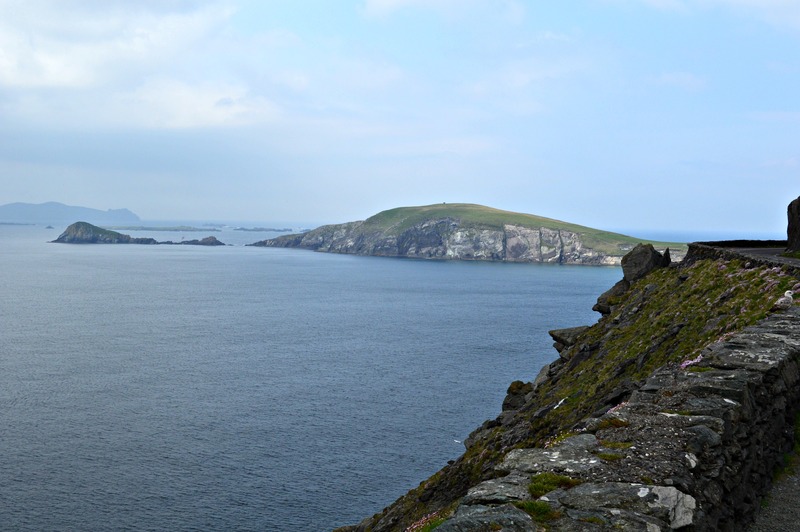 While no movie sets were to be found, the summit afforded a beautiful view of the islands and the town of Dunquin. Villagers on this hillside even saw Charles Lindbergh fly overhead back in 1927! I can’t imagine living in this remote area, let alone nearly 100 years ago! If you’re hiking with kids, make sure they have proper footwear and you keep a good eye on them. The beginning of the hike sits near the edge of the cliff. You’ll also need to climb a rock wall and help them over. I would not recommend doing this with children under 3 unless you have them in a hiking backpack! From the parking area, there is a great view of the contrasting blue ocean water with Ireland’s green. You can even hike it with a broken foot! After spending a few hours at Dunmore Head, we sped past a few of the scenic areas and headed into the town of Ballyferriter. The kids were getting hungry and we all needed a rest to stretch (and fuel) our legs. Ballyferriter was fun for our family of Star Wars fanatics! 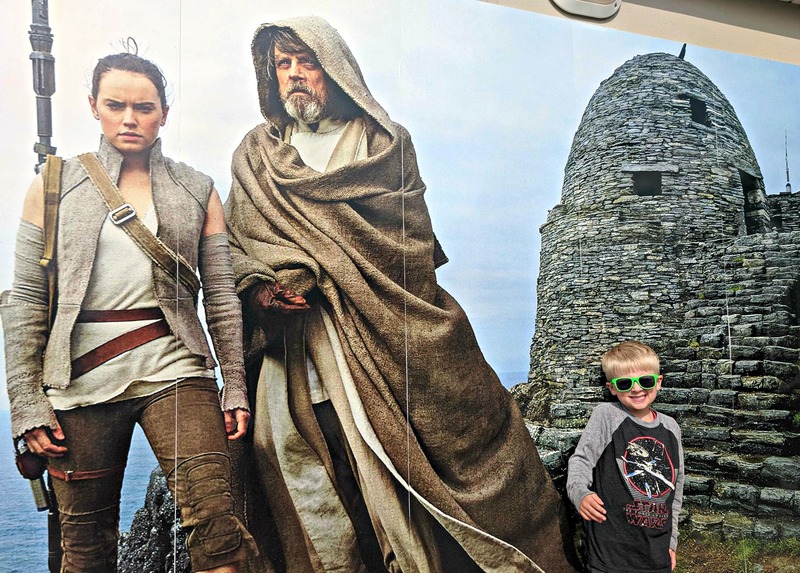 Because much of the filming happened nearby, there were characters made of recycled tires along the sidewalk and even our pub had a large photo of Luke and Rey! 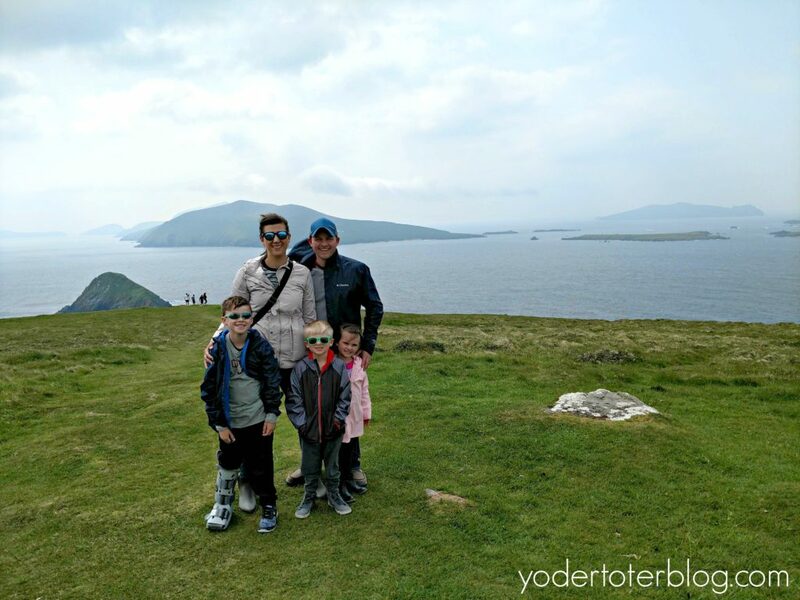 This brought a little bit of Disney to Ireland and added joy to our Dingle Peninsula drive. If you’re looking for great food (and this poster) check out Murphy’s Pub in Ballyferriter. Sit on the patio! 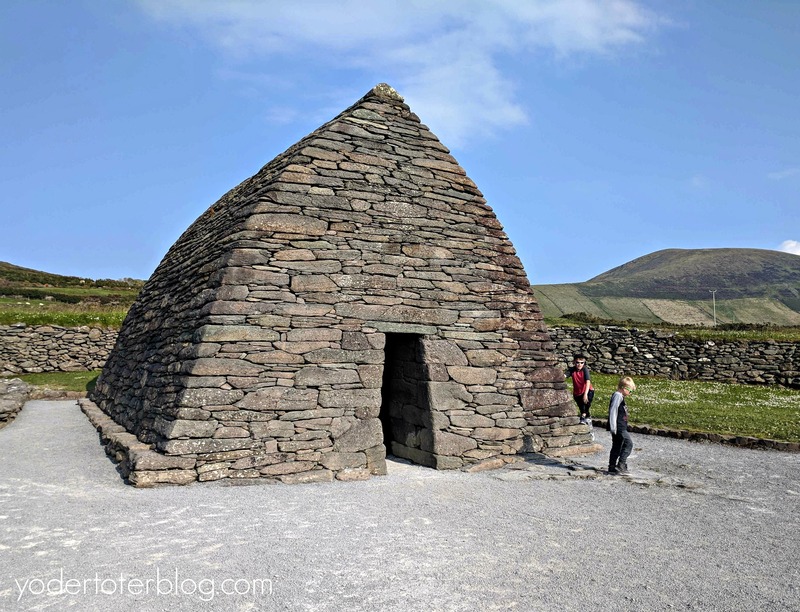 The Gallarus Oratory is one of Ireland’s best preserved Christian Churches, said to be built over 1,300 years ago! This is where Rick Steves’ book is valuable, as he gives parking directions that will save you 3 Euro (and get you a better parking spot). 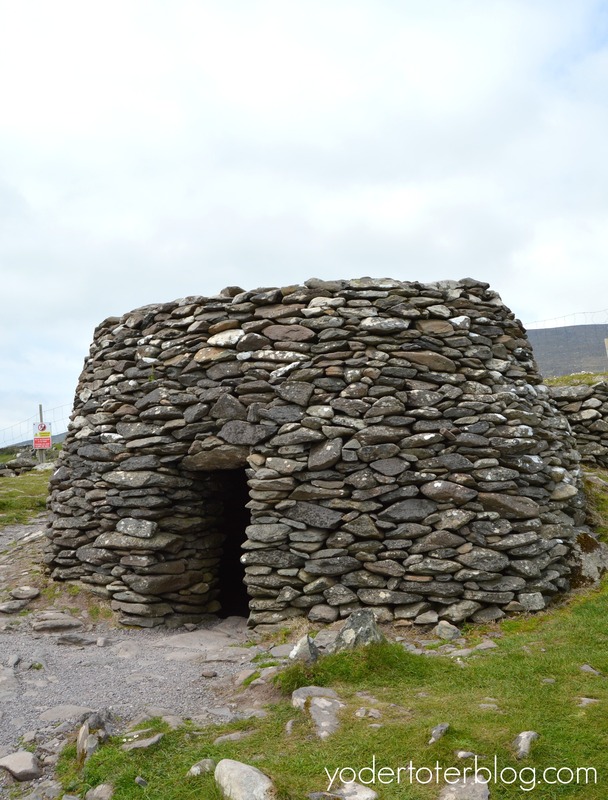 The tightly-fitted stone walls of the Gallarus Oratory are still watertight after all of these years. A look inside made me contemplate the simplicity of worship that existed in this time. No bands, no spotlights, no a/c system- just a church community in a small building with one window. It’s a humbling thing to see. It was quickly approaching 6 pm and the kids were tired of being tourists. I convinced the hubs to let me hop out of the car to see the church ruins at Kilmalkedar. This 12th-century church was the Norman center of worship for this area. 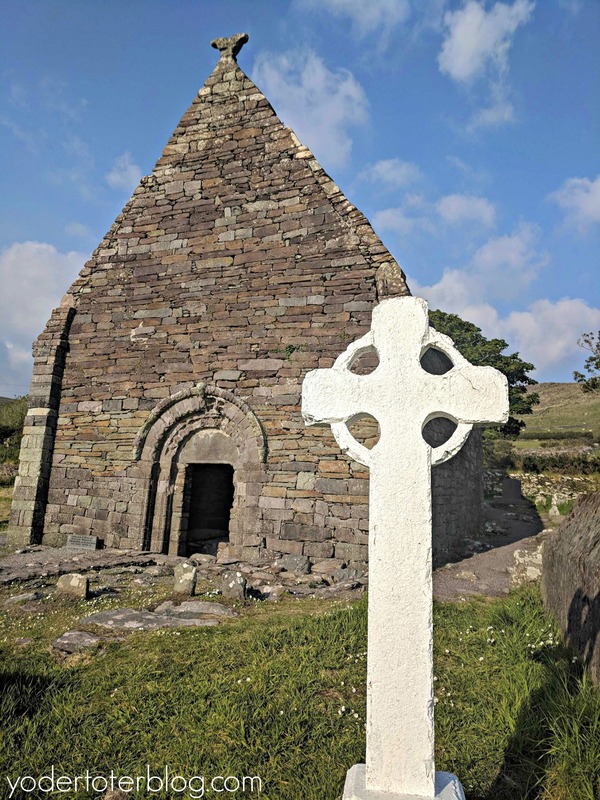 It’s eerily empty and surrounded by a graveyard, but another beautiful site on Dingle’s Peninsula. It was Saturday night in Dingle and the streets were full of those enjoying life (and alcohol). We bypassed all touristy options and headed to the playground #parentlife. We allowed the kids to play for a few hours while we talked to a local resident. Our kids made fast friends with his daughter and twin girls, “I’ve never met an Irish girl” said our eldest son. After all the beauty of the day, watching our kids in their element, while learning more from a local, really was the icing on the cake. We left town at 9pm. The sun was still high in the sky and we were immensely thankful for our delightful day on the Dingle Peninsula. Have you been to Ireland? 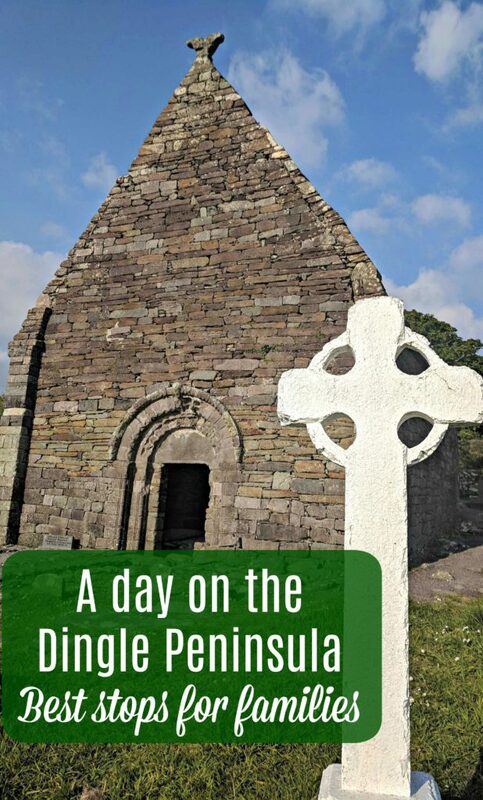 The Dingle Peninsula?